Bedugul and Tanah Lot Full Day Tours is one of our Bali Full Day Tour program which will take you to visit the some icon temples of Bali. 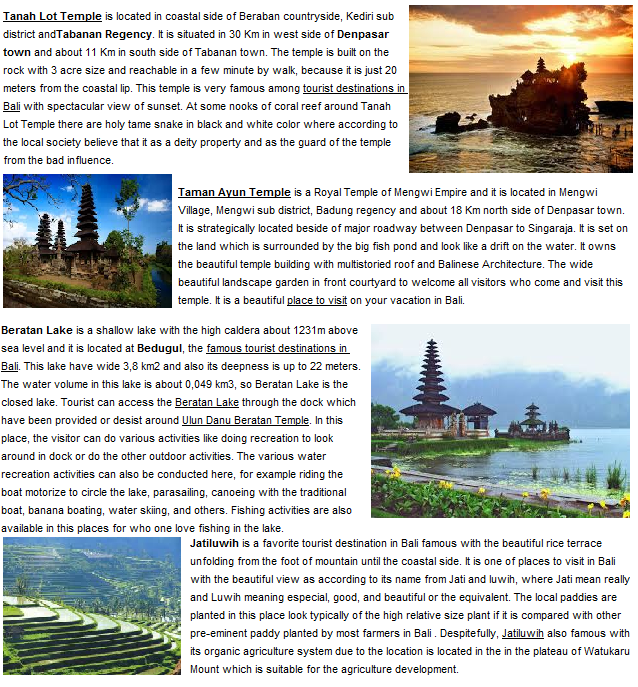 This tour we will visit Taman Ayun Temple as The Royal Temple in Mengwi, after that we go ahead to Ulun Danu Lake Beratan Temple in Bedugul , Ulun Danu Temple is a Amazing temple which floating temple on the Lake of Beratan surrounded by beautiful garden, then we visit Candikuning Fruit Market, here we will get offers variety of local fruit the popular is strawberry and passion fruit, next visit is Jatiluwih Rice Terrace, this is one of the most beautiful rice terrace in Bali and the Largest Rice fields terracing in Bali and surrounding by lush trees forest of Batukaru sacred mountain and it is under preserved by UNESCO, The last object is Tanah Lot Temple where you can see amazing sunset with unique temple is separated from mainland. Our Team who will guiding you will do our best by performing their outstanding for your convenience and enjoyable tour journey.